Shop the best selection of corded big button and extra loud phones. 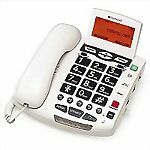 These are landline home telephones ideal for seniors and the elderly as they provide large dialing buttons for low vision and various levels of amplification for hearing loss. These senior-friendly phones also provide many other beneficial features for seniors and the elderly, such as talking caller ID, talking keypads to assist with dialing, extra loud speakerphones, answering machines and much more. 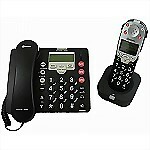 Corded Phones ship on the same business day (if ordered by 2:00pm EST). Orders after 2pm EST ship the following business day. Business days are Monday through Friday (excluding holidays). 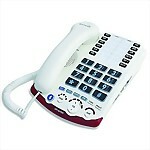 This corded base telephone with cordless expansion handset includes an amplified answering machine, Caller ID, 40dB amplification, large dialing buttons, and 5 one-touch memory dial buttons. 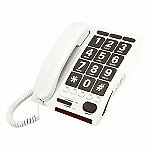 The Future Call FC-1507 is a line-powered, corded telephone with 40dB amplification for users who are hard of hearing, big number buttons for easy visibility when dialing, and is hearing aid compatible. The Geemarc AmpliPOWER60 is one of our loudest amplified phones at 67dB! It also features a speakerphone, nine (9) one-touch memory and three (3) emergency buttons, along with large dialing buttons. Dial from a Picture! 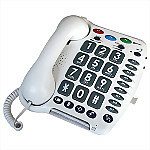 This large button, 18dB amplified telephone is great for those with low vision, memory loss, or dexterity problems who may also have slight trouble hearing a conversation. Features amplification up to 50dB and Extra Large High Contrast Keys with Braille characters. Announces pre-programmed names in your own voice! 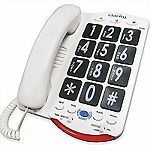 The Geemarc AMPLI200 is a multifunction corded telephone with 45dB amplification with tone control, speakerphone, and nine (9) one-touch memory buttons. Powerful 50bB amplification, volume adjustable speakerphone, Large Print Talking Caller I.D. that speaks the Name of the Caller, ring flasher, large dialing buttons & More! Expandable up to 4 Handsets! 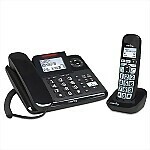 This Combo Set includes a corded base phone with a cordless handset and features a digital answering machine, 50dB amplification, and 3 user profile settings. 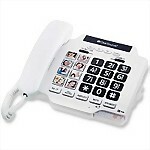 The Spirit Phone is a large button, easy to use 30dB amplified telephone with eight (8) photo dial buttons, (3) additional one-touch memory dial buttons, and a full duplex speakerphone in base. The Clarity Alto amplifies caller's voices up to 53dB and includes a speakerphone, 10 one-touch memory buttons and 15dB of outgoing voice amplification. The Voice Activated Phone is Here! 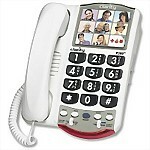 All-in-one voice dialer phone lets you make calls, end calls, and answer calls without ever needing to touch the phone! Includes 3 voice commands and 17 name/number memories. 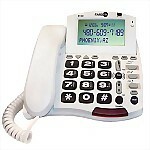 It also includes a convenient pre-dial feature that speaks the numbers before dialing. 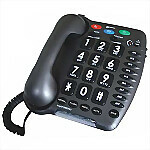 Large Button phone features volume amplifeid handset up to 52dB with an amplified speakerphone up to 77dB (at about 20 inches from phone). 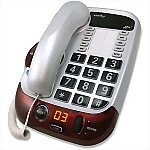 Also includes Large Print Caller ID and 95dB loud ringer with flashing light. 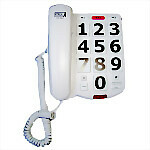 The only corded phone that can also connect to your cell phone via Bluetooth®! 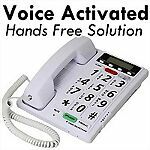 It combines easy-to-use features, like big buttons, talking keypad and caller ID, 12 one-touch dialing buttons, along with the flexibility of having both cell phone and landline calls amplified up to 50dB. Offers 55dB of amplification, jumbo keypad, front & side ring flashers, automatic "off-hook" warnings, with High-Definition Sound Technology for un-matched voice clarity and sharpness without any distortion, echo, or squealing. 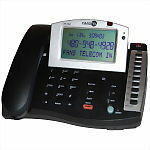 This sophisticated 52dB amplified business phone digitally adjusts volume levels for user needs and includes an 83dB amplified speakerphone, large screen caller ID, 7 one-touch speed dials, voicemail indicator light.